A couple of weeks ago we had a murky day and we sorted our books and turned our office (it’s actually the playroom but play is work and we call it the office) into a Book Nook. 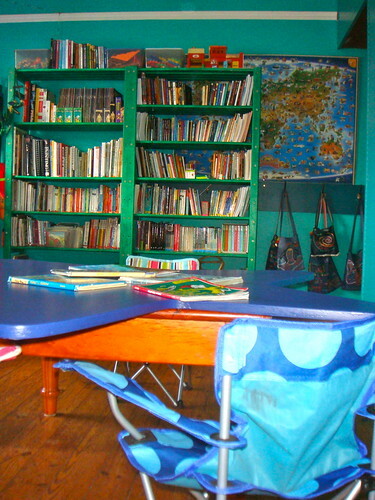 We started off with books everywhere, every table, every chair, every surface, every room. So we took a morning and did a grand sort. School books on the one side of the room and other books on the other side. 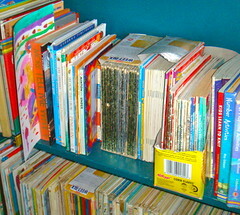 The school books had outgrown the single shelf they were on and they needed more space. 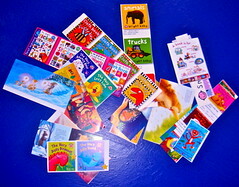 And we made some book cards. 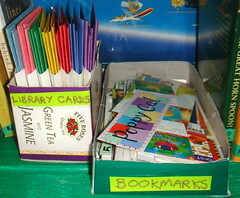 These were a quick and easy project and weeks later they are a raving success, which each kid taking out just a book per card at a time. It’s working surprisingly well and our book chaos has been greatly reduced! These work so well because the books slide back where they came out, not just grabbing a pile and jamming them back any old how or way! And should the adult people have their books in a little less chaos – well it could work for them too! 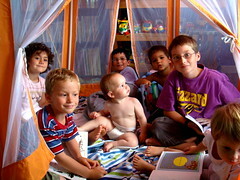 Then we made our Book Nook… cosy and fun, we bought our play tent in and set it up with cushions and kids and a couple of books! This worked great but it wasn’t long term. Big as the room is, I couldn’t bare to clean around a gazebo and we needed it out of the way for other important games. I thought a book table with a couple of chairs might just do the cosy trick. So I brought in their Christmas Camp Chairs. But I really had to address The Book Nook Table. I love this table. I got a guy, who had the tools to cut planks of wood, to cut the shape out for me and he made the table base and I was thrilled with it. But, alas, it has sat in the garage for the last two years – the legs were flimsy to start and could not stand up to the robust treatment of four boys and three girls. One leg broke and it was deemed unsafe and out it went. But I needed to revive it for our Book Nook. Out it came into the sunshine: And these are the goodies I needed, some paints, brushes, cleaning fluid and cloths and sandpaper to get started. Now if you have seen our house – well color is not an issue!!! And our garage is packed with rainbows of paint left over from walls and cupboards and shelves. And off we went: Sand, Paint, Sand, Paint, lightly sand, Paint. done. Then we took off the flimsy, broken legs and left it to completely dry for a couple of days. In it came and we put it on top of an already existing and sturdy coffee table. It fitted exactly – they were made for each other! The table top is just resting there, but heavy enough not to move without the help of the father person. So that’s the table, ready and steady! Why, oh why did I not do this job two years ago – it really only took half a morning and most of that time was watching paint dry!!! Then our new school books arrived. 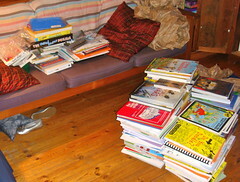 And we would need to re-shuffle again before we could squeeze all the books in – done that! So boxes off the shelves and books in: sort, sort, sort, label, label , label. 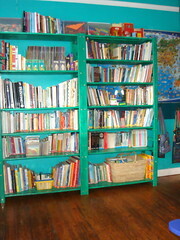 A grade per shelf and a spot for art books and another spot for poetry books and so on. These books are precious beyond precious and they have to last se7en kids through their schooling. Now I especially didn’t want a one year old ripping through our schoolbooks. Good as she is accidents happen and I would rather it didn’t happen with schoolbooks. So here is the trick. 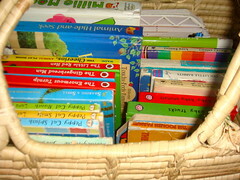 Pack the books in tight, and there is a basket of board books that are easy to grab on the bottom shelf – for her royal oneness – problem solved! The other ordering trick I discovered was that little kids love a series – they can never take one in a series off the shelf. They absolutely must take the whole series off – all The Barbar books, all The Golden Books. So where we have a set I pop them in a cereal box. The box comes off the shelf they get read all the way through, the box goes back on the shelf – ta da!!! Popped them in a cut off tissue box and there we have our book mark collection, ready to use. 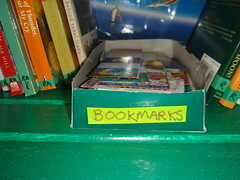 Finally, I couldn’t have schoolbooks wandering off the shelves in all directions. Especially when the person that needs them will not be able to find them – hmmm. Even I can expect that lame excuse!! !So before it happens I made some library cards. I used some card, cut in four and folded over. Staple the bottom corner and then you are done. I used se7en colors, because I have mentioned before we are mostly color coded in our house. Each kid has their own color more-or-less and their own set of cards. And in each set of cards they can take four books: A story book (Dream); A fact book (Delve); A craft book (Do) and A wild card. And these work just like the book cards above slide it in where the book belongs – that way we can see who has the book we are looking for. I took a sealed envelope, cut them in half and popped each kidlets cards into a pocket. Into a tea box (it fitted!). There you go sorting and organizing done. Finally if they need to take the book they are reading for a walk around the house then they pop them in their book bags and take them to the couch, their bed, in the car – whatever. No loose books floating and no books just grabbed off the shelf. That’s it our Book Nook is done and it was a lot of fun getting it all together! Here is the view from end to end. I hope there are a couple of ideas you can use here! Hay K, So glad you liked it. Sorry we don’t do house calls!!! Hay L, Always good to hear from you. 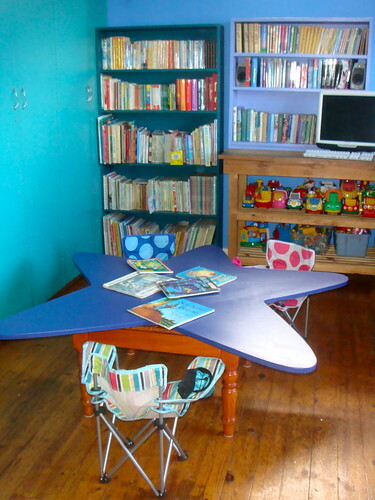 I love the table too and can’t believe I kept it in the garage for two years – what was I thinking! Anyway you have a good week! 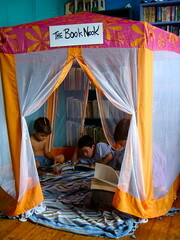 Love your book nook! Thanks for all the good tips. We don’t have any family nearby and are raising our little one entirely by "trial and error," so I’m happy to have come across your website and am starting to read it every day, now. I understand that you don’t see yourself as an expert, but seriously, you’re se7en times more experienced than I am!!! Many thanks. Hay SK, Good to hear from you again! You are so right about the expertness!!! And it does take at least a village to raise a child. And I am so glad you are popping by to read us – lovely! Have a great week. Oh my gosh, these are incredible ideas!! Thank you so much. I currently only have two kids aged one & two and already I’m wondering how to keep the books under control. You gave me lots of great ideas. Thank you, thank you, thank you. Hay you S, with the cutest baby under 1 (since I have the cutest one over 1!). Thanks for stopping by and I am so glad you enjoyed our Book Nook! Hay M, Its great living with book worms! But boy can it get out of control fast, I am thrilled you found some useful tips! what a special thing to have your kids love books; that is probably the best "gift" you can give them for their education! Hi There Aunty Muffin! Thanks for commenting… Thanks for all the help you give them in their quest to read every book in sight! I just found your blog this week, and I really enjoy reading about your family 😉 Thanks for the ideas. Hi there A, Thanks for visiting and nice to meet you too! Hi S, Glad you liked it! Thanks so much for stopping by! Wow! Thanks so much for this! We are flooded with books at our house, so I will be pondering how we can implement similar ideas. Love it!! Hi E, Tell me about the book flood! I popped over to see all your beautiful boys! And what a great cupboard!!! Oh I just love how you have organised the books and the learning area. Well Done! Oops forgot to put my link just so you don’t think the crazies are lurking around, well I am crazy but in the nicest way! Love your blog BTW. 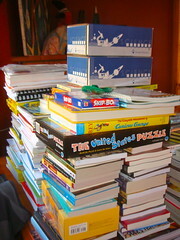 Hay crazy C – in the nicest way… Glad you liked our great book sort… not to mention loving our blog! Thanks for the visit, thanks for the comment and you have a great day already!!! When I saw this post I wondered if you used sonlight curriculum… then I saw a link in the sidebar so I’m assuming you do. Next year we are going to homeschool preschool w/ our now three year old. I have been looking at sonlight. I love that you had so many books you needed reorganize…. I dream of such a "problem"! When do you order next year’s curriculum? Do you use sonlight w/ all your little ones ( school aged)? Would you recommend it? Thanks so much! Hay C, We have Sonlighted for se7en years and about to start the next! So yes we are heartily attached to Sonlight and all that it offers us. Love it, Love it, Love it. Yup the button on our blog means we are Sonlighters and you can click right through to Sonlight from our blog there. I love the bag idea. 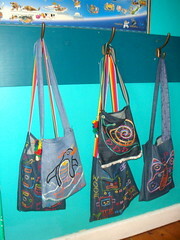 I always wondered why people made bags for the kids. ha-ha. Now I know. I am definitely going to put the book bag idea into use. Just have to figure out where I can hang them… hmmmm… organizational ideas needed. I love your blog. Hi dd, the nice thing about bags is it is very easy to see who has left their one lying around!!! Hay J, Not a problem – Love your Dr.Suess Day goodies! Thank you for your comments on Reader’s Warehouse and your support. Thank-you Thomas – It is always fabulous to hear back from a review!!! Frankly we cannot rave about your store enough. Your staff are always very welcoming and friendly towards all my kids when we visit. And I can’t say the same for all bookstores!!! 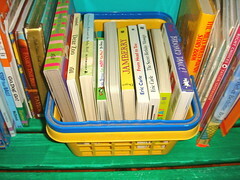 And you have a great selection of kids books: classics and current. Thanks for the best book corner in Cape Town!! !